1. Today is my mom's birthday - happy birthday mama! 2. Working on top-secret projects for Interweave Knits and Vogue Knitting... So cool! 3. I'm pretty excited about the Socks For All Seasons club! I just finished knitting up the first pattern for March, it's being checked out by the test knitter right now. All I can say is that it's um, you know what? I can't say anything about it yet. No spoilers here! It's not too late to sign up. Details here. In fact, I finally started a Ravelry group! It's called Keep on Knitting in the Free World and it will be a pace to post pictures of your club projects, chat, get help, whatever! The Ravelry group is here. I hope you'll join me! 4. Hey! 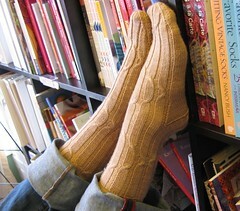 Interweave is selling the Freshman Cable Sock Pattern I designed for Knitscene Fall 2009! It's available here, exclusively. 5. Tomorrow is my pal Lee's birthday. Go on and wish her a happy one, and while you're there, check out her connect the dots stitching kits! Wohoo, just joined the ravelry group! I'm really excited about the IK and VK-things, so proud of you girl! Big hugs from me and a cold Sweden! Aaaah. I had actually thought in my head that the "Ides" of February might be a March sock clue. But HOW could she make that into a sock? She did and Ide best be getting started on it.